Is Blogging Journalism? Yes ! A South Carolina court has ruled a blogger practices journalism and is thereby protected by freedom of the press law. 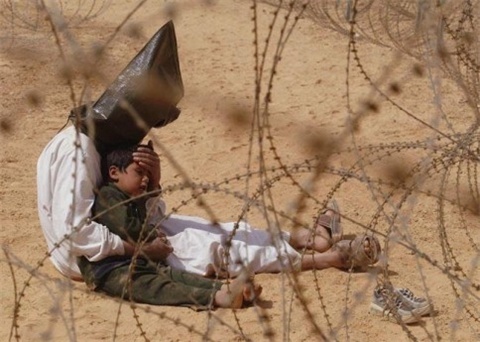 An Iraqi man sits comforting his young son at a holding centre for prisoners of war in Najaf, Iraq. The body of an Afghan boy who died of dehydration is prepared for burial at Jalozai refugee camp in Pakistan. A starving boy places his emaciated hand into that of a missionary in the Karamoja district of Uganda. NBC reporter live on the Today show makes believe she's paddling through the treacherous flooded streets of Wayne, New Jersey when two men pass in front of the camera ruining the illusion. Katie Couric and Matt Lauer crack up. It was just another "Judy Miller Moment". "It's not like we were trying to pass it off as something it wasn't," NBC spokeswoman Lauren Kapp said. CNN's Anderson Cooper interrupted Sen. Mary Landrieu (D-La.) thanking some of her colleagues, declaring that he had "been seeing dead bodies in the streets here in Mississippi" and that for people to hear politicians exchanging praise "cuts them the wrong way right now, because literally there was a body on the streets of this town yesterday being eaten by rats because this woman had been laying in the street for 48 hours . . . Do you get the anger that is out here?" This kind of activist stance, which would have drawn flak had it come from American reporters in Iraq, seemed utterly appropriate when applied to the yawning gap between mounting casualties and reassuring rhetoric. For once, reporters were acting like concerned citizens, not passive observers. And they were letting their emotions show, whether it was ABC's Robin Roberts choking up while recalling a visit to her mother on the Gulf Coast or CNN's Jeanne Meserve crying as she described the dead and injured she had seen. The following excerpt is from The Progressive Review, edited by Sam Smith. ...as journalism was increasingly learned academically instead of vocationally, the great curse of the campus descended, namely the abstraction of the real. Reporters, regardless of their perspective or biases, became removed from their stories. Instead, they were merely 'educated' about them. And the news stopped being as real. Finally, the corporatization of news meant that everyone in the system from reporter to CEO reacted to things with the caution of an institutionalized employee. Thus, the decline of investigative journalism as it was too much of risk for all involved. In short, journalism has become more scholarly, more snobbish, and more scared and, in the process increasingly has separated itself from the lives of its readers. The primary purpose of politics and journalism should be to serve the good of the people, but they have become dysfunctional, disconnected and have lost touch with their purpose, former Washington Post reporter Carl Bernstein said today. and journalism as I do now," Bernstein said. Whew! I am not alone. I'm a former full-time journalist turned journalism professor. I continue to commit occasional acts of journalism, and I retain a deep affection for, and commitment to, the craft and its ideals. That’s why it pains me to say this: The performance of the U.S. corporate commercial news media after 9/11 has been the most profound and dangerous failure of journalism in my lifetime. These repeated failures of journalists to hold the powerful accountable should be a subject of serious discussion... If journalists don’t provide a truly independent source of news and instead routinely subordinate themselves to power -- especially in times of war and national crisis -- it’s difficult to imagine how citizens can adequately inform themselves so that they can participate in the political arena in a meaningful way.